I’ve stated many times that I love Friday evenings in SL. I love winding down the week with good friends and good music late at night at TriBeCa, with Calli spinning an eclectic mix for us. THIS Friday was going to be even more fun. The 1st Question was going to be on FRIDAY this week. *grin* I never did ask why, but my assumption was that some sporting event or other was interfering with the usual Sunday night time slot. Pooky Asterdam always finds the wittiest, smartest, most pleasant folks to be contestants on the show. 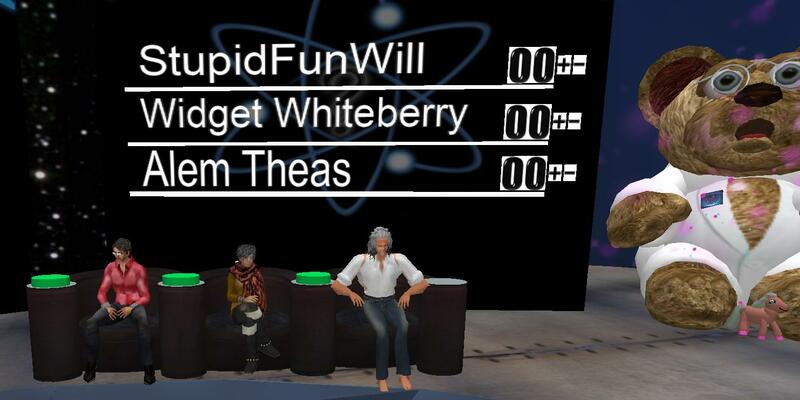 This week the guests were StupidFun Will, Widget Whiteberry and Alem Theas. Oh? You don’t recognize them? Perhaps you know them better in a different life. Will is Will Wright, creator of The Sims and new member of the Linden Lab board. 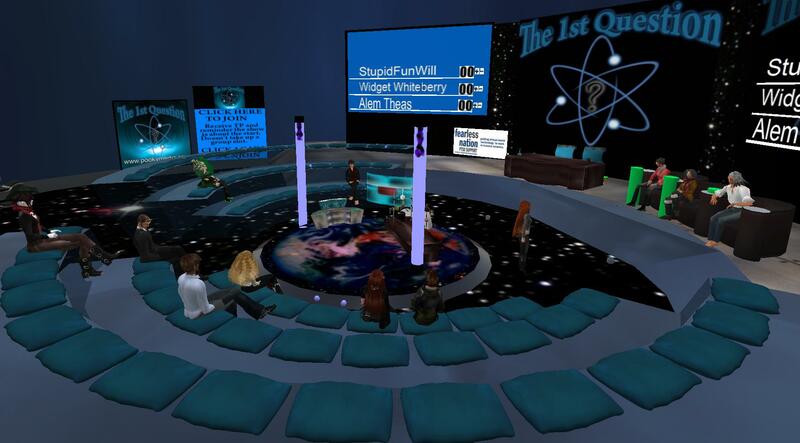 Widget is the co-producer of Virtually Speaking, conversations on politics, media, economics, science and more, hosted before live audiences in SL. Alem is Grady Booch, known internationally for his ground-breaking work in software architecture and engineering, and collaborative development environments. You can see why I was eager to catch this edition! I’ve mentioned my love for red. 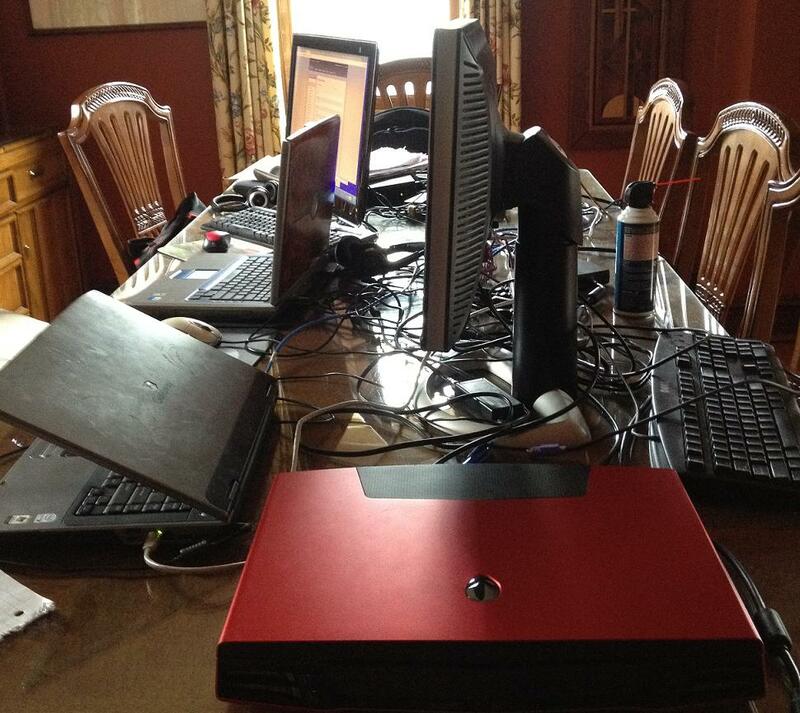 I’ve mentioned my love for beautiful wonderful red Alienware M17x (all the lights glow red). I may have mentioned that my beautiful red laptop has been having a few difficulties with the video card. We’re not exactly sure why, but I will say support has been wonderful. The tech was due Friday morning to replace the cards and the fans and a cable. A very pleasant young man showed up, opened up my beloved machine, took out nearly every part, cleaned them, put in new ones, closed it up. He plugs in the cord and ….. nothing. My heart stops. He unplugs the cord, replugs. Nothing. It’s 1:30 on Friday afternoon. My gaming computer is….. omg….. It’s dead, Jim. You might have thought that I’d kill the tech, since my machine WAS working before he touched it. As badly as I felt – that poor child was ashen. Besides, I had no time to lose in hysterics or anger. I HAD to get a working computer. FAST. My Thinkpad T61p has not been able to handle virtual worlds in over 8 months. My husband needed his gaming computer (oh sure, ‘needed’ it. as if…) When we upgrade, we don’t discard. There was my old Dell Latitude somewhere in the house (the one that I used 4 years ago when I first came to SL), my husband’s old Dell Inspiron, and my sister’s laptop that I used at her house. There IS hope. I grabbed the Inspiron (please understand that poor tech was still at the table working on my Alienware, on the phone with HIS support crew). It is so out of date I have to hardwire to our network because the wireless isn’t working. I stare at the unfamiliar setup. The tech looks over and I kind of wail: where do I START??? He points out that in the lower corner of the screen is the auto-update icon. Oh. Good idea. Well, it ended up taking about 2 hours, and 78 updates, and a new video driver but whoo-eee, that Inspiron was up and running. Doing a fairly decent job. I downloaded V3.2.8, the development viewer. 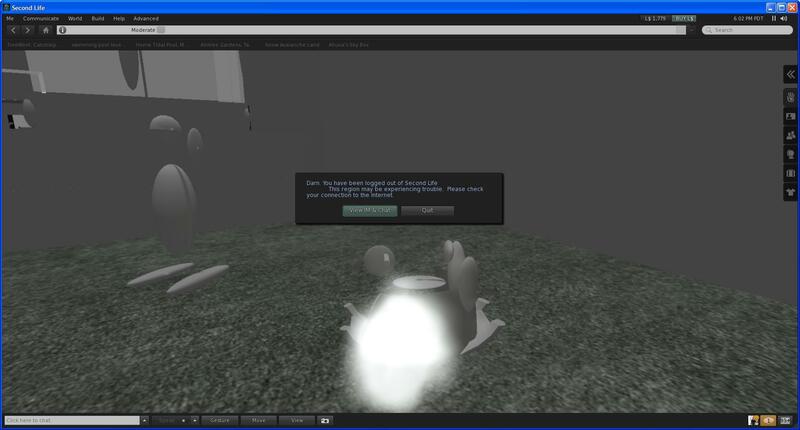 Then I headed inworld to try it out. I started at home, went to Fogbound to check music and motion, visited Honour and her horses. So far, so good. The little-laptop-that-could was still going strong, so it was off to TriBeCa where we enjoyed LOTS of new Leonard Cohen. Yet again, another wonderful evening spent with friends: smart, witty, talented, musical. Oh! You mean *I* was supposed to do that? I state this freely and without coercion: I LIKE viewer 2.0. Yes, I understand all the reasons why it’s not as good for building, I don’t like that I can’t detach tabs, and all sorts of other things. But mostly – I LIKE it. I know most of you will stone me for this – but I actually DO find it intuitive. I never found v1.x intuitive. I realize this puts me on the pale of civilization, but it’s simply what it is. Lately, however, I have been having problems logging on to v2. It seems to hang and I hold my breath while I hope that I make it to the promised land. On Monday it began failing at the office – I could not get in. Sigh. So I used v1.23. I got in, no problem. I figured it was a firewall issue or port or something. I logged in from home, no problem. Tuesday – same thing at work. Then at home – I could not log in again. I have two laptops: my work laptop and my gaming computer. Sigh. I have bad karma. Something is not right with the SL settings on my Alienware and until I can take it to Zha so she can rid my hovercraft of eels, I have been using the Lenovo. It’s been fine. Until the last week or so. Slow, slower, not working at all. So – here are the symptoms. You see if you can solve the mystery first, okay? You can see the pictures of the errors. The meter bar would get to downloading clothing and then I’d be logged out. Then it only got to downloading world (or whatever that message is) and I’d be logged out. Ready? I have to thank Zha Ewry who patiently listened to all my testing, suggested other tests, read my log files, and helped me stay hopeful and sane through the hours (literally hours) that it took to deal with this. We both agreed that perhaps it was a scripting issue (which of course doesn’t explain why I could login on the Alienware. I logged in on the AW in v2 and stripped myself down to pants, a shirt, a skin and eyes. No hair (oh the pain), no AO, no scripts, no HUDs, no attachments. By the way – did you know that v2 does not know what you were wearing in v1.23 when you logged out, but v1.23 DOES know what you were wearing in v2 when you logged out? That also caused me some puzzlement as I tried to debug. Zha cleared that up for me. I thought maybe I had too much inventory, but Zha has twice as much as I do. I know many people who have much more inventory than I have. Okay, I was now a newb. Ahuva/Lenovo/v2 = Fail. I uninstalled and reinstalled code. Fail. 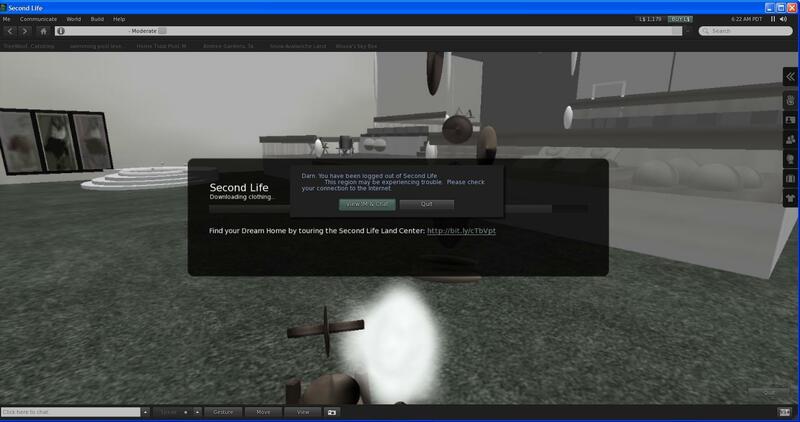 I did rmdir /s SecondLife. Fail. I reinstalled. Fail. I erased. Fail. I stared baffled at the screen. I shutdown the machine. Not restarted – shut it down. Came back up. Installed v2. Logged in Ahuva/Lenovo/v2. Crawl. Crawl. 60 seconds and counting on “downloading world”. Then – OMG!!!! I was logged in. I was there. I tp’d home. I noticed that my messages said 99+. I was still convinced that somewhere somehow we were dealing with a memory issue. What else could be different at that point? Okay Sherlock – do you know the solution yet????? I took a deep breath and headed back in and…… got there. Fairly quickly even. *smile* I logged out (still a newb) and came back. FAST. *grin* I had a moment panic when I went to my outfits and nothing was there. But then all my inventory filled in. I put on my outfit: hair, skin, HUDS, scripts, AO. Yeah – I’m loaded. 🙂 I tp’d to my sky box. Logged out. Logged in!!!! Fast! Complete! *grin* I loaded up everything else on the Lenovo that I run during my typical day. Logged in. *grin* I was BACK!!! I guess this means that I am now expected to clean up those unread messages. *grin* Fine, I can do a little housework now and then. Now comes Fricker Fraker time! Fricker is bidding farewell to summer and hello to autumn tonight!! Come join us all for a wonderful time at Piper Point! 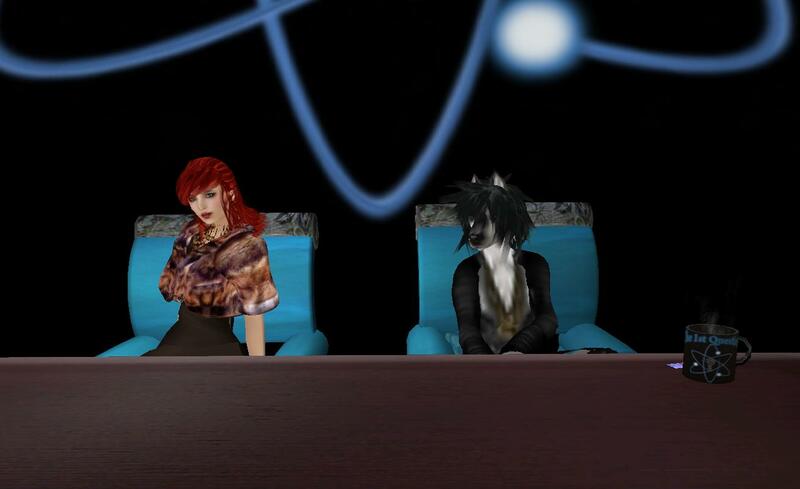 At 6pm SLT! Get there early for Crap Mariner’s storytime!! WHY do I still like SL so much???? This makes no sense whatsoever. I’ve spent thousands of real dollars on new equipment: pc, wires, modem, router. I’ve reorganized my schedule so that I can go inworld every day. And everyday SL “rejects” me. I crash. SL crashes. I can’t rez. I can’t tp. My inventory won’t load. It’s not just me. I hear everyone else chatting and they have crashed. They aren’t rezzing. They can’t tp. I see friends go offline and come back online w/in the next few minutes and I know that they either crashed or are trying to improve their connection. When I logon and see 52,000 people inworld and then I crash and log back and see that now there are only 43,000 people inworld, I blame SL, not my setup. I crashed last night – couldn’t even log back in. Tried this morning to get back and finish what I’d been doing. I could get inworld but couldn’t rez, couldn’t get my inventory to display. So there I stay. Thank goodness I’m someplace enjoyable! But if SL were my real-world love interest – NO WAY would I tolerate this relationship. And yet….. I’ll be back tonight, trying yet again to rez. Hoping I’ll put on my party clothes and meet up with friends and savor SL. Because it is so much fun. Either you “get that” or you don’t. And the new performance quite wow’d her. well, that’s how I HOPE it all works out. upgraded the cablemodem, tested it directly – no packet loss. so it must be the router, right??????? So today (actually, now yesterday) was my birthday. I didn’t want much. My husband had already given me this beautiful laptop. It was a work day, that was fine. All I wanted was to do what I had to do in my every-day life and then stay up late and celebrate in SL. I logged on at 10 and that was the last thing that worked. From that point on I couldnt rez properly, I couldn’t tp, my chats froze. I logged in and out and in and out and in…. Over a dozen times. Literally. After the first 30 minutes I never rezzed as anything other than a cloud. I could IM to my friends – nearly all were on. And I couldn’t get anywhere. I locked and crashed repeatedly. Poor Michele – what a wonderful friend. She listened to me as I literally cried and wept. I tried on both machines: new one with the 1.20 client, old one with the 1.19 client. I could not get logged on. I’m still crying. At this point I want to power down and never open the machines again. I’m so discouraged and disappointed. It’s my party and I’ll cry if I want to, and I want to and I am. I HATE my computer!!!! HATE IT HATE IT HATE IT!!!! It’s stupid, it’s old, it’s slow, and it DOESNT WORK!!!! It keeps crashing!!!! Melissa called me and she’s on. She has a great box of goodies to share and wants to take me to a neat place!!! I’m invited to a Wimbledon Party and I have nothing to wear and even if I had something to wear I CANT GET THERE!!!! It’s not fair!!!! MAD MAD MAD MAD!!!!! I have HOURS ahead of me to play and my stupid stupid stupid computer is not cooperating!!!!!!! WHAT AM I GOING TO DO???? This is all someone’s fault. NOT MINE!!! I dont do hardware. (actually, i dont really do software either, but that’s a subject for when I am NOT throwing a major temper tantrum). I WANT MY SL!!!! I want to find white stiletto heels and a cute skirt and a nice top to wear to the party tomorrow and i want to go meet melissa and i want to PLAY!!!!! This is totally NOT fair and I am filing a complaint with the authorities and the powers-that-be and everyone and anyone else. NOT FAIR!!!!!! I WANT MY SL!!!! MAKE IT WORK!!!!!!!! !